My wife had the idea to be a family of Mr. 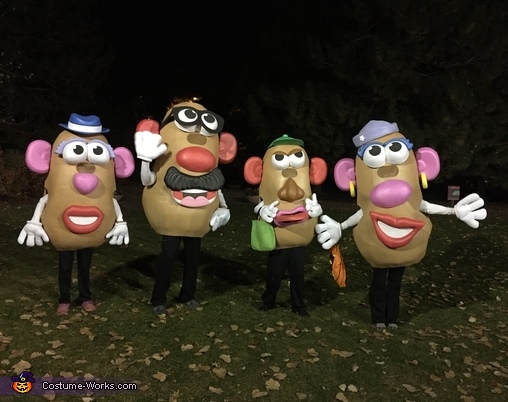 Potato Heads for Halloween for a few years now, and we finally did it. So here comes the Mr. Potato Head Family – with interchangeable parts of course. Like most of our costumes, the potatoes started as solid models on the computer. It was a challenge to figure out how big to make them and where to have the eyehole (a painted mesh screen). In the end we ended up with 2 “adult” sized potatoes for my wife and I (Dad), and 2 “kid” sized potatoes for my 9 year old daughter and 11 year old son. After modeling the potato shapes, I took the computer surfaces and ran them through Pepakura software to create all the flat pieces. I then prototyped the potatoes using card stock - a lot of it. The final potatoes are made from sections of 5mm craft foam glued together using contact cement on the edges. About 150 12x18 sheets of brown EVA foam was used for the 4 potatoes. A couple strategically place wire hoops were also used to help keep the potatoes in shape. Each potato had 9 identically sized hole-sockets build into them to be able to attach various parts. All the parts had mating foam pegs that fit into the sockets. The parts were also made from 5mm thick EVA foam. In order to get curvy 3-dimensional shapes, a homemade vacuum table was used to form the foam sheets over simple molds. I heat the 5mm thick EVA craft foam in the oven at 275F in a metal frame, position it over the mold, and then turn on the vacuum to shape it. I make the molds from pink insulation foam sheets. All the parts are interchangeable and we had fun mixing and matching. We typically attend several local zoo Halloween events, and of course having 4 giant Mr. Potato Heads walking down the path turns heads. I think I can safely say several hundred pictures were taken of the spuds. Hope you like the costumes!